Book Adventures: Carnival Girl Blog Tour & GIVEAWAY! Carnival Girl Blog Tour & GIVEAWAY! 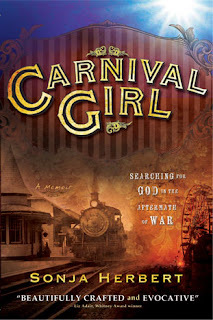 Welcome to my stop on the blog tour for Sonja Herbert's childhood memoir Carnival Girl: Searching for God in the Aftermath of War. Carnival Girl was published through Cedar Fort on June 12, 2012. To visit the other blogs on the tour, please click the banner above. For a chance to win an eCopy of Carnival Girl, please fill in the Rafflecopter form at the end of this post. Please also read yesterday's guest post from Sonja to learn a little more about how the book came about. The only life little Sonja Francesco has ever known is traveling the carnival circuit and living with her five siblings in a tiny caravan home. The family never stays anywhere long enough for Sonja to make friends or develop roots. The only one in her family, Sonja always believed in God and wants to belong to a church. At fourteen, Sonja meets the Mormon missionaries and develops a strong testimony of the truth of the Gospel. But can she live the commandments while traveling with the carnival and running one of the attractions every Sunday? Will it be possible for her to leave her family’s life behind and live the life she has always dreamed of? Carnival Girl is an enjoyable read because of its tight structure, effective language, and the window that it is into another time, culture, and lifestyle. Reading this book actually brought back a few of my own memories; living in Germany as a little girl and meeting the LDS missionaries and joining the LDS church as a teenager--but those are stories for other times. Sonja begins each chapter of Carnival Girl in first person, present tense, focusing on a specific visit from her mother who came from Germany to Utah. These segments are very short and serve as both framework and catalyst. The memories instigated by the conversations of Sonja and her mother make up the bulk of the book and come along in chronological chunks, showing the reader not only Sonja's journey from preschool age to teenager, but also glimpses of the German culture after World War II during the 50s and early 60s. During the trials of life and family, while traveling in a country working to rebuild, young Sonja searches for comfort, belonging, and self worth. No matter what school of thought or faith you may adhere to, because Carnival Girl is a memoir that deals with such universal themes, it becomes a poignant and interesting look at faith, culture, and family. Thanks for the great review and for posting the links! And I love to see the book give-away, too!